With Spring here and Summer around the corner, it's time to pack away those sweaters and bring out the tank tops and maxi dresses. When I'm wearing a dress or top that can easily show my underarms, one thing I worry about is wearing a deodorant that can promise to not only give me the protection I need, but also let's me wave my hands in the air without seeing residue. I was really excited when I was sent the new Dove Dry Spray Antiperspirant to try. I received all four different scents, Original, Cool Essential Cucumber and Green Tea, Beauty Finish Water Lily, Freesia & Jasmine. and Revive Pomegranate and Lemon Verbena. All four promises to give you 48 hour protection and leaving your underarms feeling smooth, soft and free of visible residue. I have to say I was quite skeptical because I have never found a spray deodorant that was nearly as effective as a solid. I am already a fan of Dove antiperspirant in its solid form. I have very sensitive skin and anything with any scent usually leaves me with a pretty uncomfortable rash. I haven't had that problem with any dove products yet and this is no exception to that rule. I was not expecting the dry spray to be as effective as it proved to be. I don't feel the dry spray is as effective as the solid but it's not far off. I was pleasantly surprised at how well the spray held up. I don't think I would choose the spray over the solid for going to the gym or anything overly active but for normal daily activities the spray was very effective and long lasting. Each scent is light, clean and fresh and not smelling like a strong perfume but more like a soap or body wash. The Dove Dry Spray worked great for me. My absolute favorite scent is the Cucumber and Green Tea scent and I will be a loyal customer of the dry scent now just as I will continue to be of the solid. There are times that the spray scent will be better like wearing sleeveless dresses or shirts since the spray doesn't leave behind any residue and even the best solids can leave behind residue. At other times the solid will be a better choice and I like having the versatility of both. I would definitely recommend this product, especially now with the warmer weather. 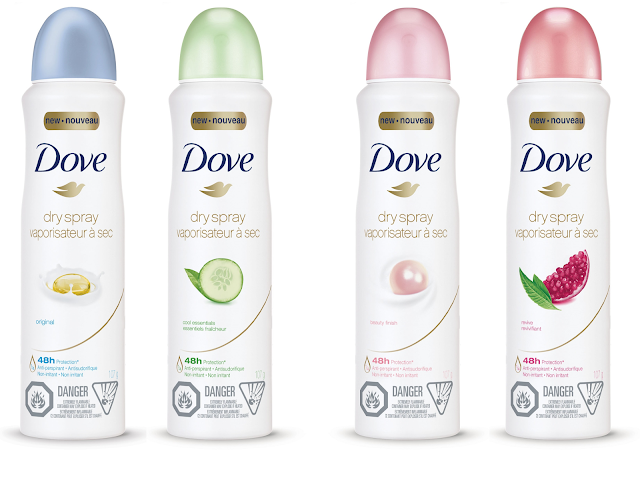 The Dove Dry Spray can be found at a store near you retailing for around $5.97. For more information about the new Dove Dry Spray Antiperspirant and other Dove products, be sure to head over to www.Dove.ca. Disclosure: All opinions are my own. I received Dove Dry Spray Antiperspirant at no cost for the purpose of this review. No other compensation was received.